I love Pinterest. I’ve been using it for close to 3 years now. It is such a great way to search and organize your interest. I used to save recipe after recipe to a file on my desktop… not organized in any way. I could never find the recipe again. Pinterest solved all my problems! I could search for recipes, craft ideas, fun things to try all at the same spot. It was also a way to follow people that had interest like me. I know some of you are already following me on Pinterest. Visit Angela @ Grassfed Mama’s profile on Pinterest. 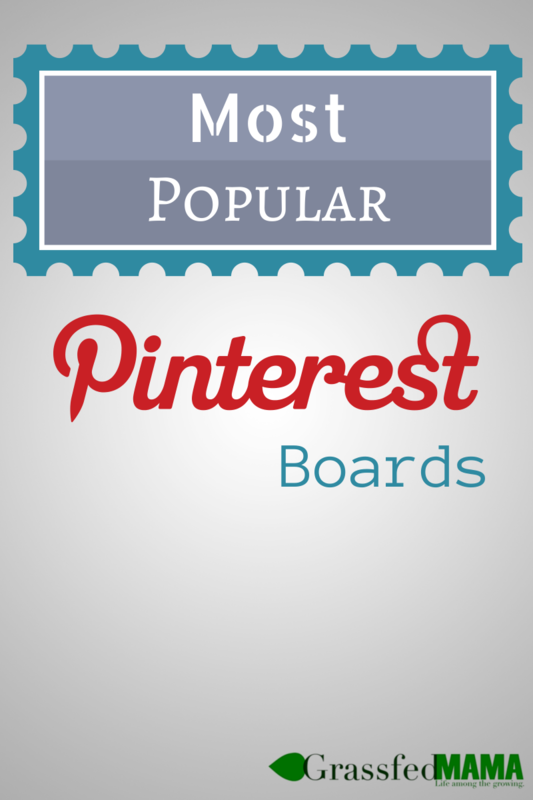 I wanted to highlight some of my Top Pinterest Boards. This first board is just mostly posts from Grassfed Mama’s Blog. I may pin a few things and I just love on there… but mostly it is just my posts (an easy way to catch up if you missed something). My blog is focused on low glycemic recipes (sugar free), healthy living tips, and fun activities and some crafts. Follow Angela @ Grassfed Mama’s board Grassfed Mama on Pinterest. This board is super popular for low glycemic foods and recipes. I like to find different recipes that fit into the popular diet Trim Healthy Mama® They alternate between low carb high fat meals and moderate carb, low fat meal. You can find gluten free recipes as well as great low carb and sugar free recipes. I also have a team of other pinners helping me find the best recipes on Pinterest for this board. Follow Angela @ Grassfed Mama’s board Trim Healthy Mama on Pinterest. Follow Angela @ Grassfed Mama’s board Gluten Free Goodies on Pinterest. This was one of my first boards ever to create. I would pin recipes here that were “healthy” in some way. There is a hodge-podge of dessert recipes for anyone one who is trying to find a healthy version of their favorite desserts. Because I was eating whole wheat when I started using Pinterest, some recipes will use whole wheat as the main flour. Most recent pins may be gluten free, low carb, sugar free. Follow Angela @ Grassfed Mama’s board Yummy Healthy Desserts on Pinterest. This is my fun board. I love to find activities to keep my daughter entertained. Anything that I think she will enjoy (or I think will be fun to try) I’ll pin in this board. Follow Angela @ Grassfed Mama’s board Fun things for kiddos on Pinterest. What are some of your favorite boards that you follow? Do you have a favorite person you follow?